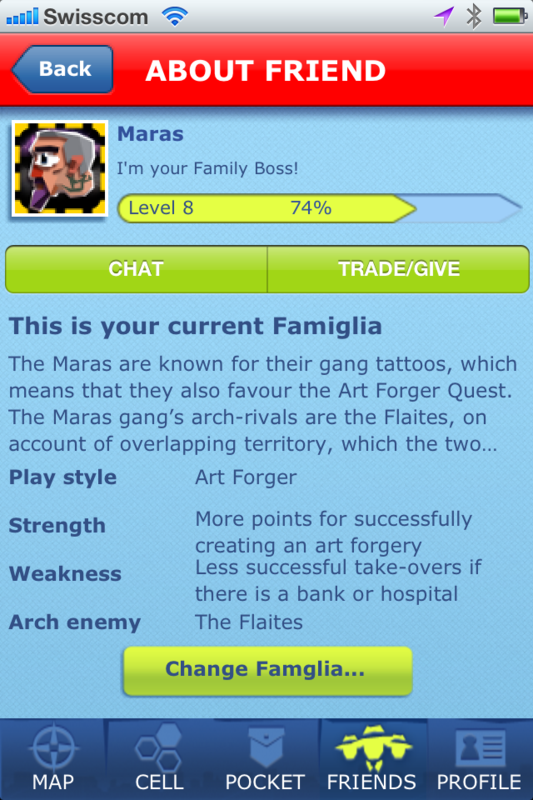 Continuing our beginner’s guide to Gbanga Famiglia, today we’ll approach the sign-up and add friends functions. These are the first steps that every Mafioso should master in Gbanga. The sign-up process for Gbanga is very easy. You can connect using your Facebook account or “sign up with no login.” If you have an older Gbanga account, you can also sign-in using your existing username followed by your password. In order to play Gbanga Famiglia, you must first decide on a username. Choose your username carefully as it will be the name that other players in the game will identify you by. It’s also the name by which your profile will be displayed on our website. Your profile pic and status should also reflect what type of Mafioso you are. Your status update is also a great opportunity for you to broadcast which Famiglia you belong to. We once heard Gbanga Famiglia described as a crazy subway station. Picture people on the go, rushing to get to work; while others are just exploring a new environment; and some are just taking their Mafia dog for a walk. It’s a lot to take in all at once, but if you hone in on a few people that seem interesting and start interacting through Chat or Famiglia games, you will encounter a new and interesting network of Mafia friends. Before you know it, you’ll have a nice group of people who want to takeover the world with you. Once you’ve sorted out your username, photo and status, you need to join a Mafia Famiglia. You can find them in a few different ways. By visiting the Gbanga website or clicking on your Boss profile under the FRIEND tab then “Change Famiglia…”*. You may also want to add some friends to your Friends List to increase the number of members in your Famiglia. Once you get rolling, you can check the learderboard, which displays the most successful players and Famiglias. You can also check the Gbanga homepage to discover new players and player activity all around the world. With time, you’ll become an expert in knowing who can be useful for your gang. There’s no set secret strategy for this — it’s completely up to your own personal strategy. Wait to see if the player accepts your friendship request. We hope that these tips will help to immerse you quicker in the new Famiglia world. Stay tuned as we’ll be posting more tips about Famiglia during the next weeks. *Feature available in the upcoming update.